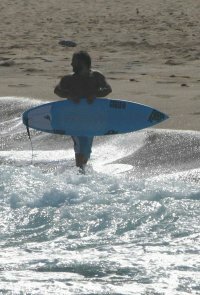 My Best Ever Session: secret spot in Sardinia, this summer 3 hours of perfect solitude. Rails, Specifics: Boxy on tail, soft through the length. My Opinion About: my favourite. it works in every condition from 3 to 6ft. Make and Technology: 4+4/4 glass oz. My Opinion About: My ste up board. General I use it over 6 ft.
Rails, Specifics: boxy on the edge! 1201 Guests have visited this profile..